Cauliflower is a weird kind of a vegetable, isn’t it? A weird, alien-like brain wrapped up in strange, fibrous leaves. Or is that just me? 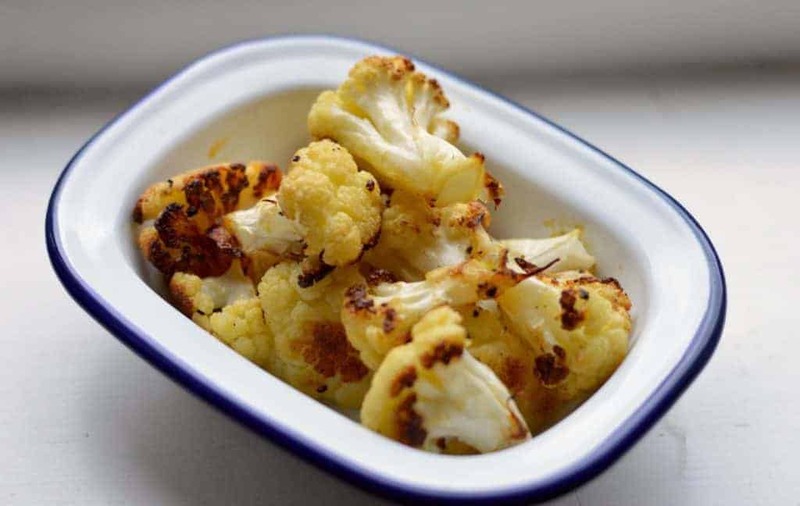 Either way, if you’re a bit traumatised by the smell of boiling cauliflower from yesteryear – no one forgets that smell in a hurry – I have a game changer for you: roasted cauliflower. It’s out with the weird and watery, in with a vegetable that has so much more flavour to give. For me, the overwhelming memory that involves cauliflower is something slathered in cheese sauce. Well, more accurately it’s a shriek. My family and I were in York for a short break and were at a Sunday carvery, some poor woman mistook custard for the cheese sauce. She shrieked when she realised and I was told off for giggling. I must have been under 10; these days I suspect the telling off was because it was funny, but my parents were embarrassed that I was doing what everyone else in the room wanted to do but social norms prohibit. Fast forward a couple decades, and the world is in a different place. By itself cauliflower can be a bit bland and tasteless; often playing second fiddle to broccoli. But of late it’s appearing all over the joint again. It’s being ground up for pizza dough, people are replacing rice and pasta with it, and it seems to be everywhere you look this winter. Being the veg du jour, it’s featuring all over the place at the moment, and listening to an episode of Radio Scotland’s The Kitchen Cafe all about it recently – you can listen on the Radio Player, if you’re interested or looking for ideas – I ended up picking one up on my way home. 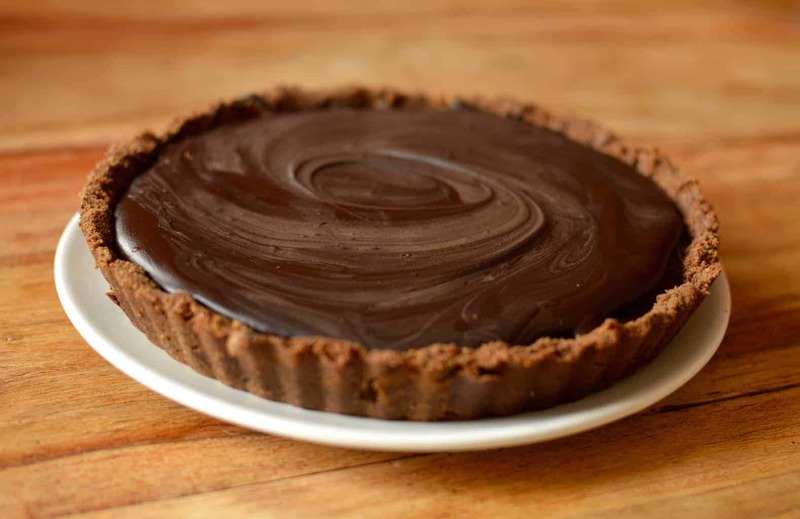 So how do we use this seasonal treat? I’d recommend roasted, preferably with pesto all over it. Roasted cauliflower with pesto is one of my favourite ways to use a cauliflower. 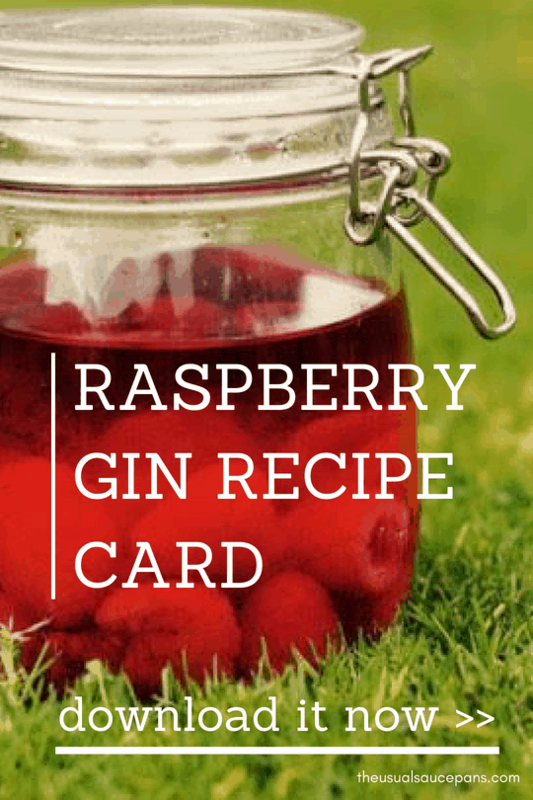 It’s really simple, but really delivers on both flavour and vibrancy. It’s great as a side dish or a snack to get people in the mood for main course. You could also use it as a speedy weeknight wonder dinner if you like; it’s even better if you have a bit of baked sweet potato in there as well. This is probably my favourite thing to do with a cauliflower – if you’ve impulse bought a cauliflower and are not sure what to do with it, then this is where you should start. It’s great as a quick weeknight wonder dinner with a baked sweet potato or as a side with a larger meal. Serves 2 as lunch or dinner or four as a side. Break your cauliflower head down in to florets and scatter them across a large baking tray (you’ll be left with an ugly great stalk – don’t just chuck it away, use it for soup!). Drizzle with a little of the olive oil and season with salt and pepper. Toss in the tray to fully coat them. Bake for about 40 minutes. Check every 10-12 minutes, and shake the tray so that they roast on all sides. A little blackening is exactly what you’re looking for. 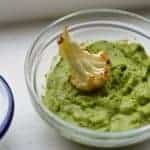 About ten minutes before the cauliflower is cooked, chuck all the remaining dry pesto ingredients into a food processor – basil, pine nuts, parmesan, lemon juice, garlic (crush before adding), salt and pepper – add about half your remaining oil and blitz the processor for 5-10 seconds. 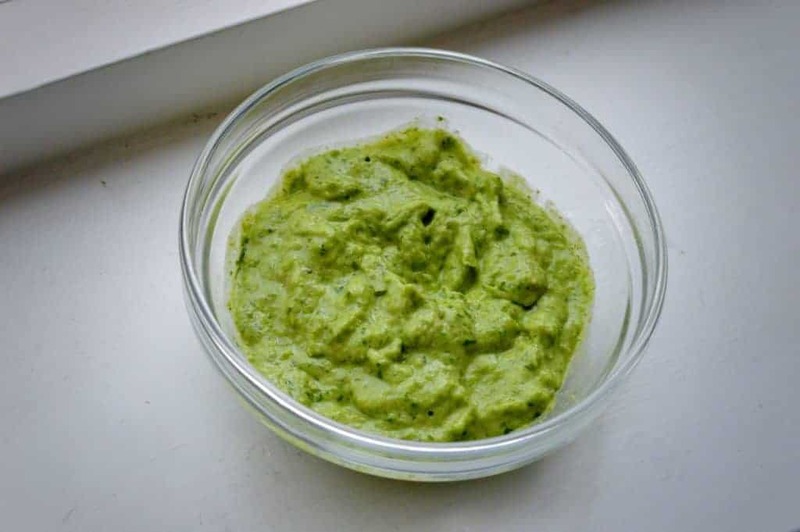 If your pesto looks dry, add about another tablespoon of olive oil. Blitz again. Continue blitzing at 5 second intervals until you have the pesto consistency and all the pine nuts are broken down. You might not need all the oil, so don’t worry if you have some left over. Put the pesto into a little dish and once the cauliflower is cooked transfer it into a bowl or serving dish. 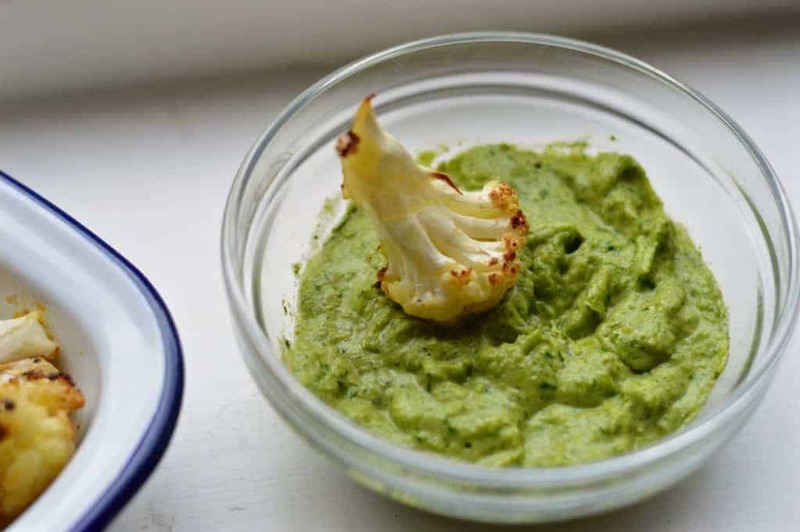 either drizzle your pesto over the cauliflower or use it as a dip.